Beautiful isn’t it? Hard to not look at the Wind Rivers all day…the incredible continental divide…with the amazing ever changing views. This was Wyoming and I loved it! A typical scene of the Green River Drift…I rode it several times with the ranchers and cowboys either gathering cattle from close to Yellowstone in the fall months driving our cattle home on the drift or in the early spring months, when we gathered our cattle and moved them out for a few months to the high desert on the other side of Pinedale. 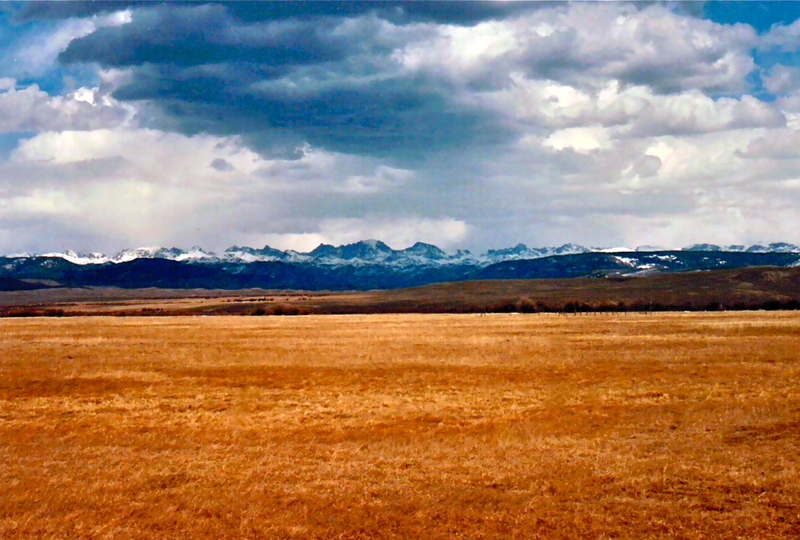 The photo above was taken in the early spring months right after we were hired to manage the ranch in Wyoming. The house to the far left became our home, but first they had to remodel our house and also the owners house which was the log home more in the center, it was a 100 year old log hone. 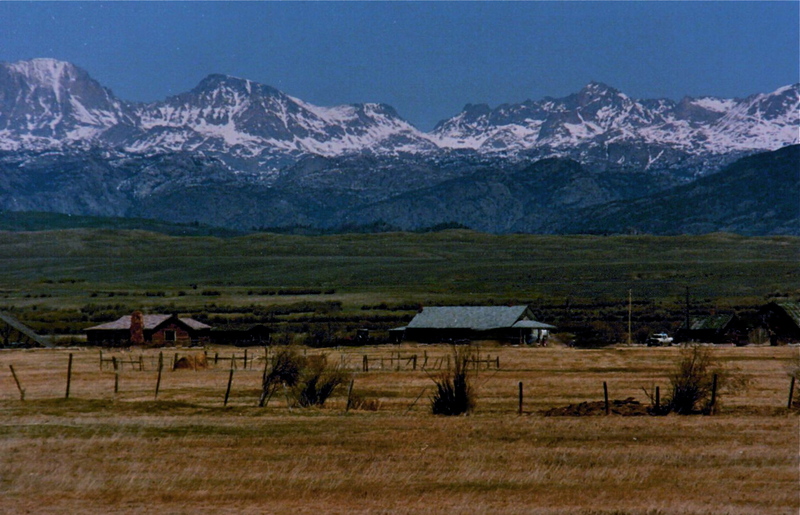 All summer as we chased flood irrigation water, I watched the ever changing Winds, it was like watching a movie that had different scenes all day long:) The tallest peak in Wyoming is Gannet Peak at 13,809′ and I had the daily privilege of this view out my windows. 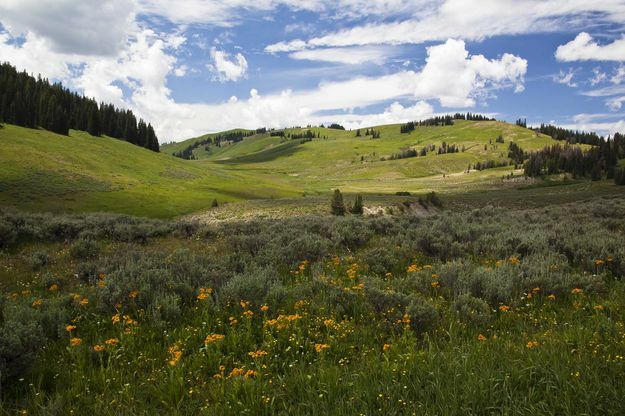 We lived at 7500’…the mountains were incredible as they gave me a beautiful ever changing photo, that I hung on my heart…and yes it’s still there:) Wyoming was…mesmerizing! 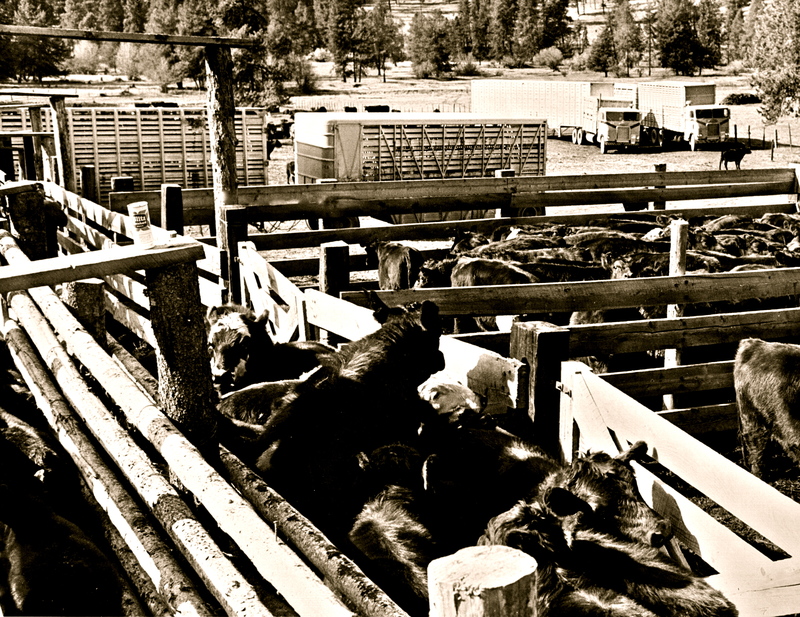 Pinedale was an awesome little town…and here we go…part two. In Oregon, we had two kinds of rattlesnakes to contend with…down close to the hay fields you have the standard large rattler…often 6′ long ones lying around the hay fields and anywhere else…you had to always watch where you stepped. We also had to contend with timber rattlers in the higher elevation where we had cattle pasture. Timber rattlesnakes like to curl around the tree branches to blend in and then scare the heck out of you! The first time I saw one curled around a tree branch hanging I wanted to scream oh my GOSH!!! I think I did but not exactly those words! And currently where we live, life has changed in the last 15 years…we have a neighborhood watch and we are armed, ready to defend ourselves if need be. 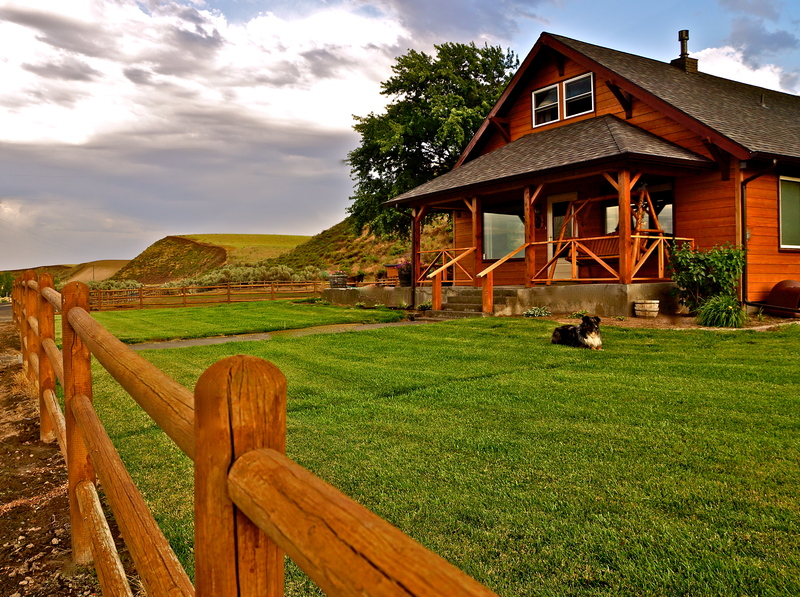 I grew up out here during winter months and we used to not lock our doors…now we have security systems on our house, shop and barn along with several high-end cameras. In today’s world, there are people who love to steal things to make meth…farm and ranch country gets hit lots due to the farm chemicals we use on our crops and weeds etc. They steal chemicals to make their meth. If you do not have chemicals, then they steal fuel and copper or steel. It is a crazy world we live in and we are on full alert…laser light and night vision scope…life has changed out here. Don’t bug us! You know you live in the middle of nowhere when you begin to visit more with the cows and horses than you do with people as there are no people around…and as time goes on, you begin to hear the cows and horses talking back to you…sharing the moment and shooting the breeze! 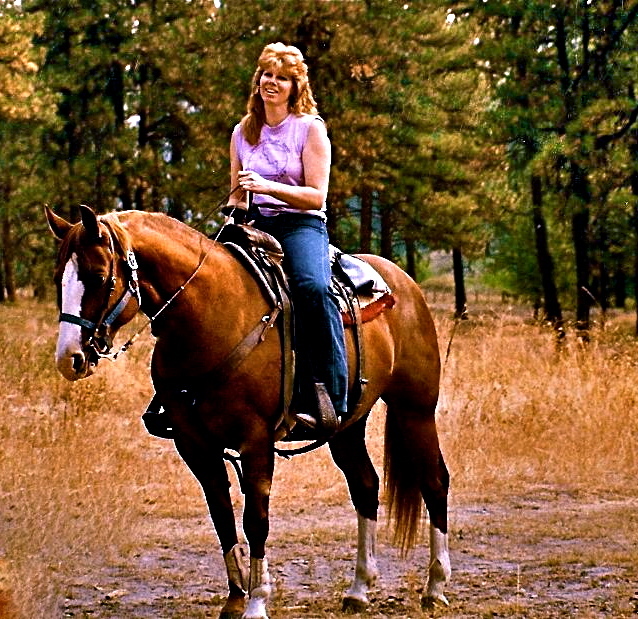 The very first time I rode up in the higher elevations in Central Oregon, to gather cattle, I thought I would be safe from rattlesnakes…I mean, come on, everyone would think that at 5500′ elevation, rattlesnakes would not like it right? I had yet to hear a true rattlesnake rattle at me nor had I seen any rattlesnakes…WB told me they were around down low close to where we lived. Little did I know! 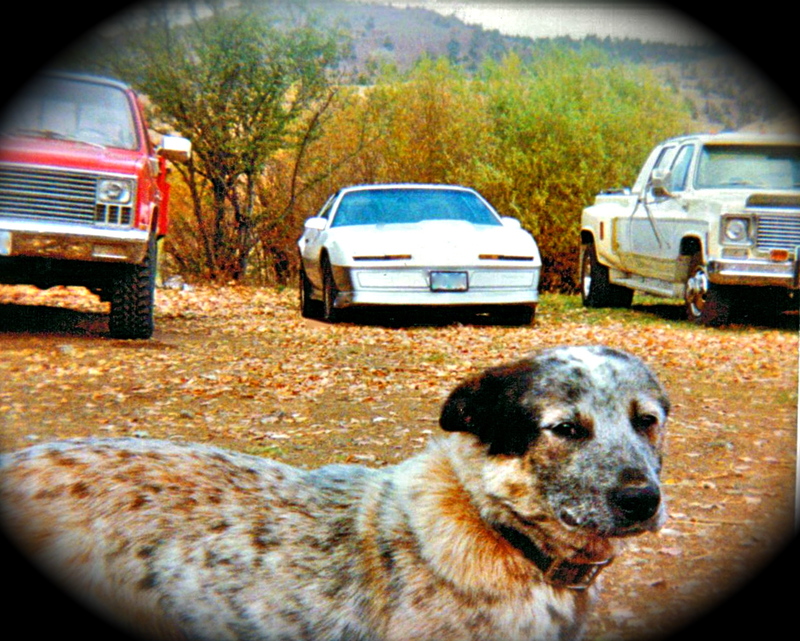 “Hank the Cow Dog,” was about 10 months old in this photo…he is the 6 month puppy that rode out the massive flood on a piece of a wood and was washed up against the house in a corner…we were so happy when we found him! In Wyoming, we could feel eyes watching us late at night through the curtains on the large living room windows…its -35 below so who would be standing out there watching you anyway…as you look, you scream, as pressed to the glass is 4 sets of eyes with huge heads and bodies attached to them…MOOSE! Did you know that moose have two moods? Curious and MAD! You hurriedly pull the curtains back together….and the moose bumps into the window….you turn off the lights…and the moose bumps up against the window again with a devious moose grunt….you quietly scream again and run to your bedroom hiding under your bed…hoping they will go away…HA! The next morning all four moose are curled up on our deck waiting for us! 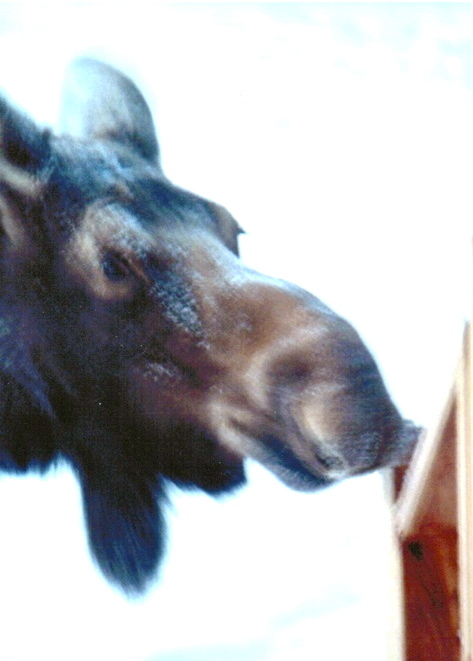 “Good morning Miss Moose…why are you kissing the hand rail on my porch? Miss Mouse gave me a look and grunt and I shut up…Miss Moose can do anything she wants! Sorry for the blur, but she would not hold still for my camera! 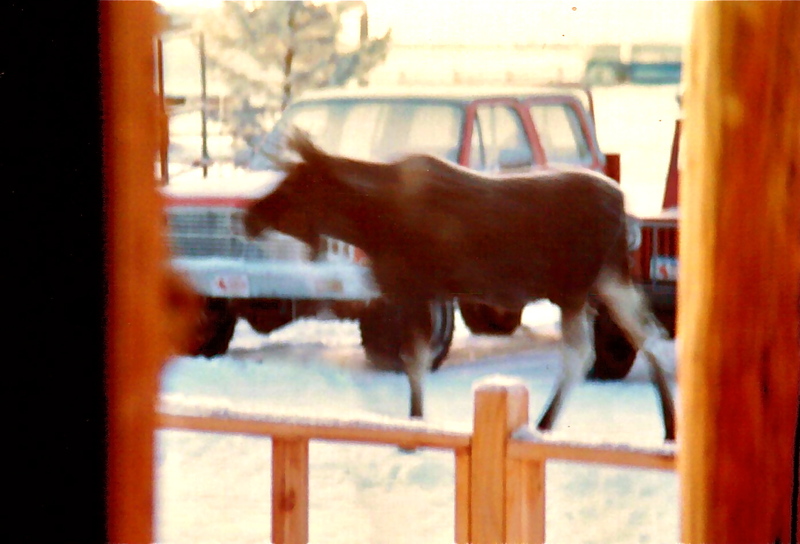 I loved Wyoming…even the cold weather with curiously mad moose and every adventurous part! 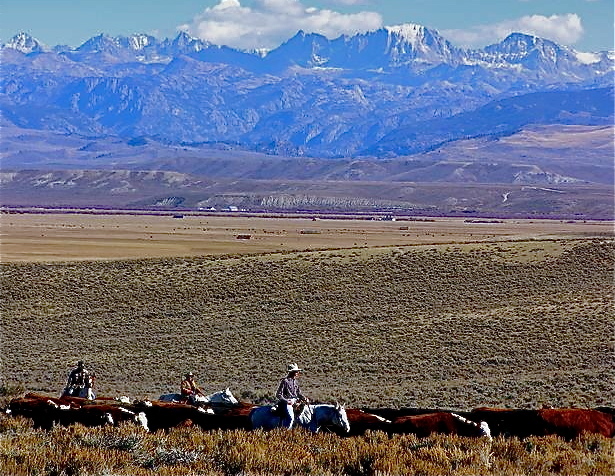 You can ride and gather cattle for miles without seeing another person or any sign of civilization…you almost feel like you are the only person left on earth. It is an amazing view to see…no power lines, no smog, no busy highways, no people…almost like unsettled land. 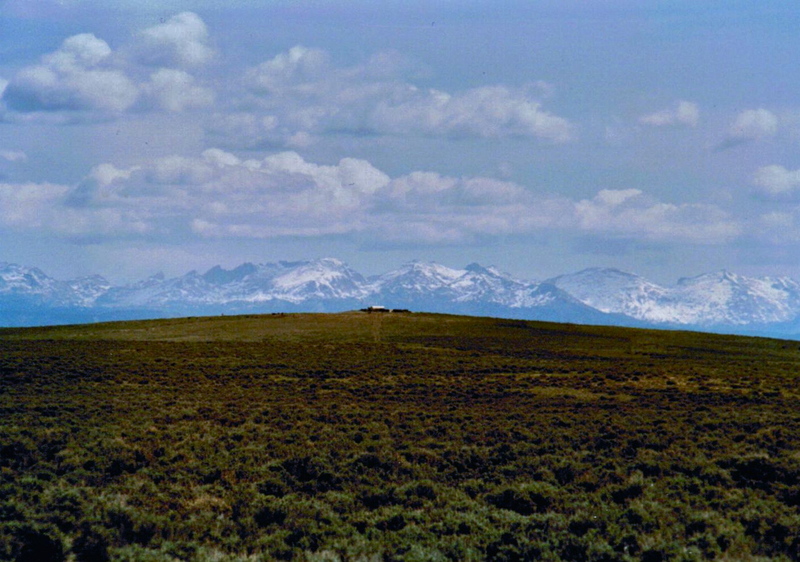 This photo shows the Wind River Mountains or the Continental Divide, close to South Pass on the Oregon Trail. The objects you see on the hill are the water tanks…we turned the cattle out on the high desert during the late spring months and watered them via windmills…we had several to maintain. 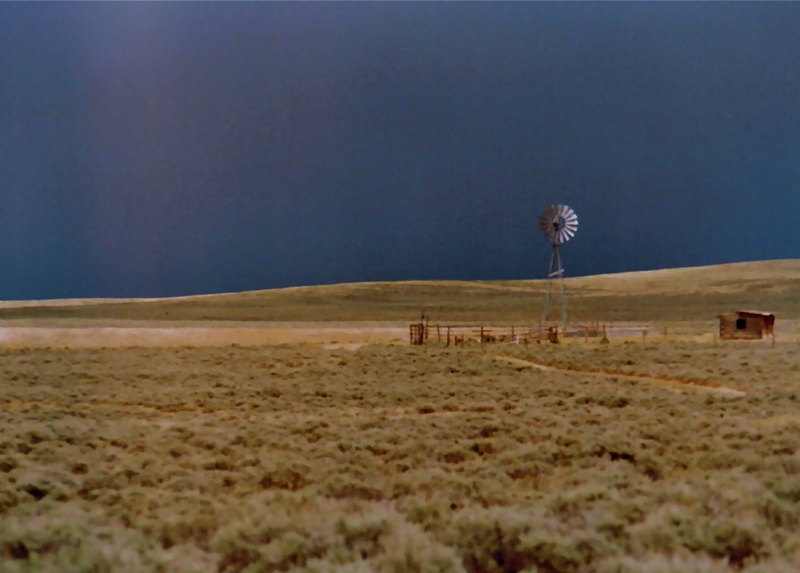 Often the desert had quick squalls that would drop in fast with thunder and lightening…the sky would grow black in the middle of the day…but the storms left as quickly as they came. 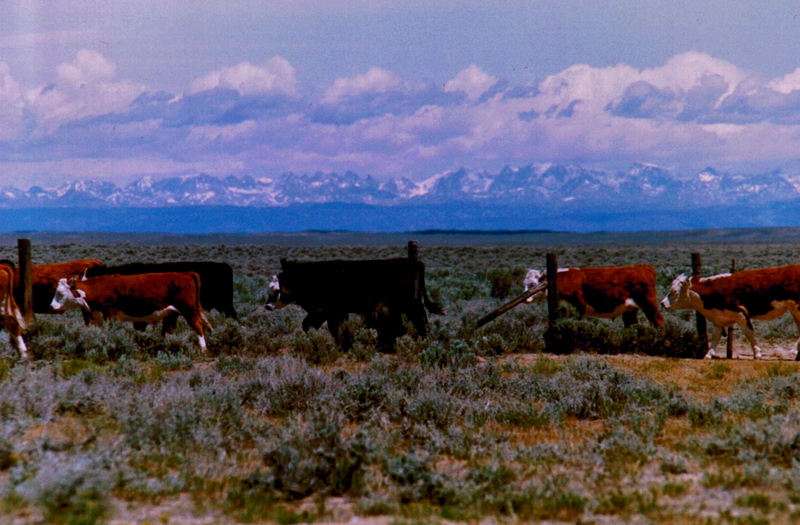 The high desert was vast and huge…when it was time to gather up 1000 head of cows on our 15,000 acre pasture, it took us one morning to do it. I could not believe how fast it went. Growing up on my folks cattle ranch, it took us a few months to gather 800 mother cows and calves on the summer range in the Blue Mountains. And even though you think the desert is flat, it is not as it has more small hills than you can see. I wondered what it looked like to the men and women who made it over South Pass? 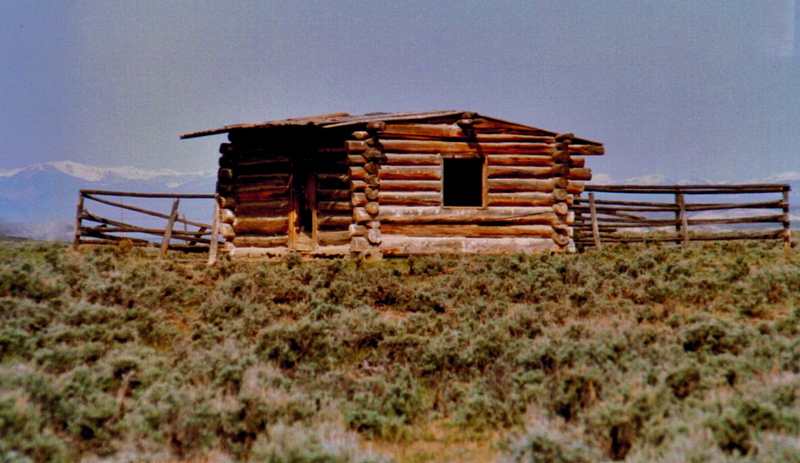 The wagon trains crossed the desert right through the acreage we ran cattle on…what did they think once they got over the divide and saw the vast desert…and the Wyoming Mountains ahead of them? Who may have lived here, was it a family or maybe a fur trapper? 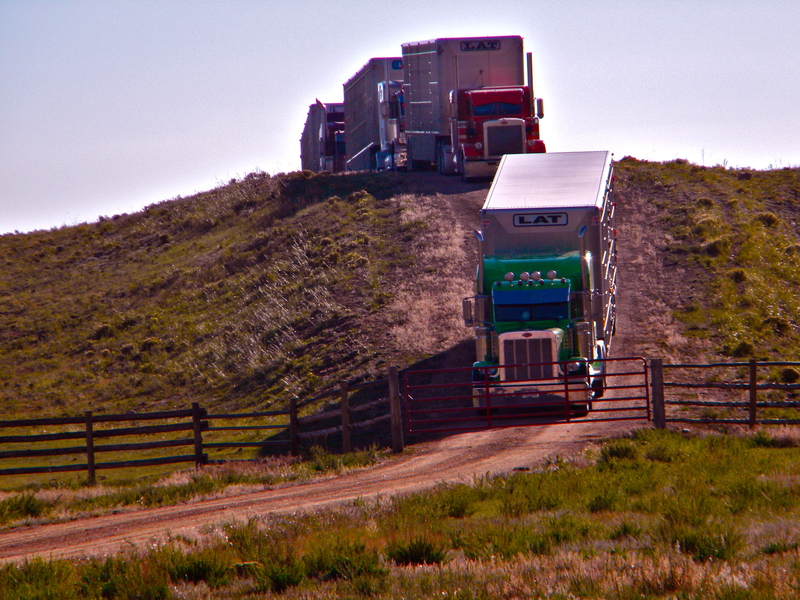 First the cab lights crest the hill and disappear as the they drop down the last hill only to pop out in time for the next cattle truck lights to top the hill…15 trucks in all…choreographed to drop into the ranch all in a row…like clock work! You can hear the sounds in your head and in your heart…the sounds of aluminum truck gates opening, cattle hooves on metal in the loading shoot…you see the breath of both men, horses, cattle and dogs…as the cattle are quietly loaded like clockwork…like they all knew it was time to head for the mountains for the summer range. As one truck is loaded you hear the rev of the semi as it pulls away from the loading dock and the next truck pulls in…you hear a few jokes as your brand inspector signs off on the cattle as you know him like family…and as the last truck leaves shifting gears gaining speed to climb that first hill…and it dips outta sight only to bob up one more time into the bright sunshine of daybreak…it tweaks your heart a bit…another winter is gone. 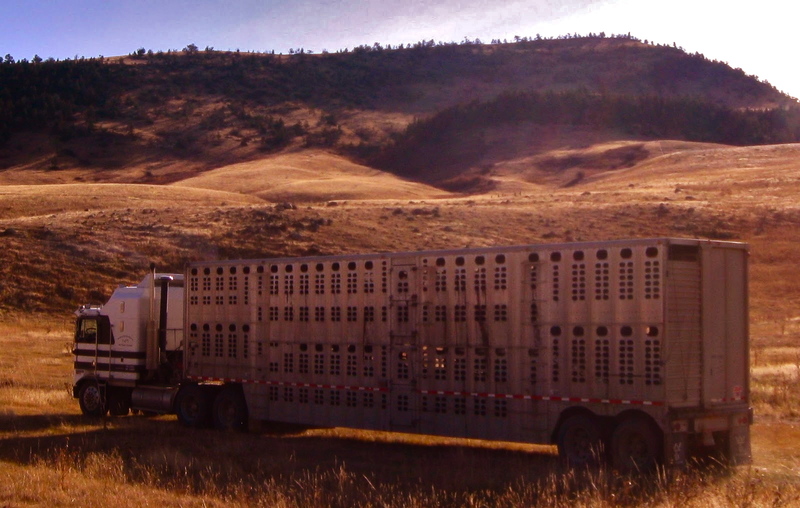 The trucks have 200 miles round trip to go so it will be a few hours before they return for more cows…800 head mother cows, along with calves, yearlings and etc. 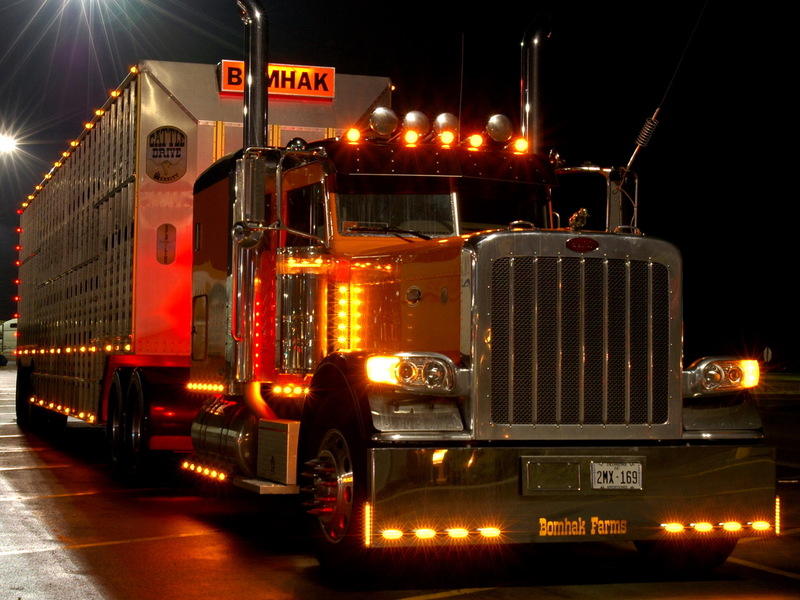 took around 25-30 trucks to haul…the day began in the early morning darkness and would end in the middle of the night or the early morning hours up on the mountain ranch. Your mind plays back over the last few weeks of gathering and the finality that happens each June 1st…as time seems to stand still until cattle and man return in late fall. Note: The description I used above is based on my memories of growing up on my folks cattle ranch in Oregon where the cattle truck sounds and memories began at an early age. 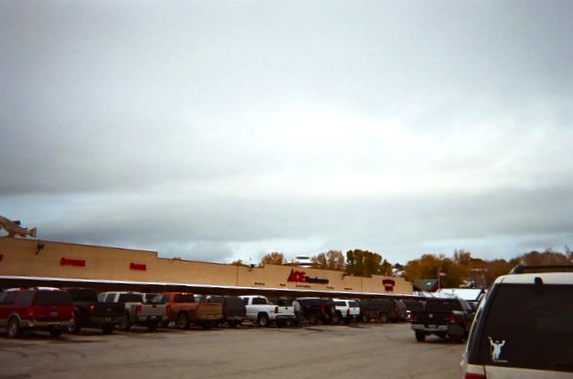 There is one grocery store in Pinedale to shop in and the prices are through the roof as the next closest grocery store is over 100 miles one way on two lane country roads, either South to Rock Springs or Northwest to Jackson Hole. Note all the pick ups…yep cowboy country! 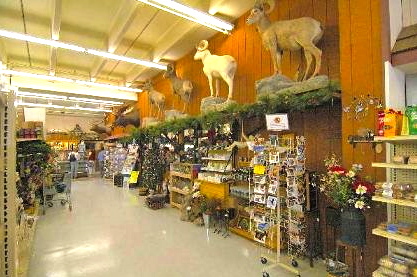 Once you go into the grocery store to shop, you note that there are LOTS of wildlife mounts looking at you as you shop down the aisles. In the frozen food aisle I looked at Fox, Bobcat or Mountain Lion. On other aisles we saw Mountain Goats, Bears, Antelope, Coyotes, while the bigger animals had a head mount, such as an Elk, Moose, Deer…Buffalo…and even fish! It was quite an experience as the store had all the food we needed except fresh fruit in the summers. It also had hunting and fishing supplies, guns, knifes etc. everything you can imagine under the sun…for the husband as you shopped. 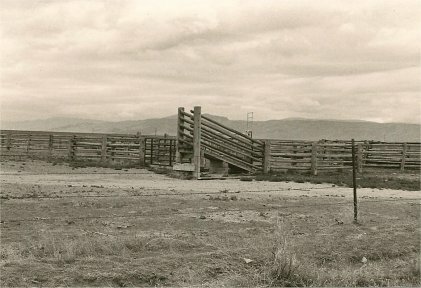 And you accomplished good things in your life on a remote cattle ranch…the incredible isolation and the hard work at hand, can be overwhelming to some, but for me it was always a great joy…one that I grew up in and one that I will never forget. I knew I lived out in the middle of nowhere…the boondocks…the hinterlands…and I loved every part of it! It is my life and who I am…I’m thankful I have stories yet to tell…filled with memories of a cowgirl’s life lived in the middle of nowhere…I would not trade it for anything different! Have a great evening and a fun week and weekend! Hey! I believe someone is using your picture as their own on a facebook post… Just thought you may want to know. I have a screenshot but it will not let me post it here. Me neither HRCG but I have no complaints so far this Summer; in fact it is a moderate summer this year…I wish we could export your heat to the North Pole, lol. Wow you are true grit people; I could ndot live in such heat. I am no good after 85 F it seems. Then again I can deal with cold weather better than most….I guess it is what we are accustomed to. I say get the A/C!!!! LOL. I am thrilled Minnie is doing well & thrilled for Nylablue too. She is a miracle! They BOTH are miracles aren’t they? Power of Prayer! & Good vets too! LOL. We are not fond of the darn hot heat either…and it is tough to live in especially if you are outside! Hope your PC is all good again….I know the feeling! I hear it is warm out your way! We have warmth & some humidity but nothing like what the West is having! I think the more time we spend with 4 leggeds on a one to one basis they bond with us. Nylablue knows when I am upset & not with her & she will snuggle me. If she has been naughty (who would think, eh??) she will retreat to her bed or on top of cupboard til we ‘make up’…lol…. Nylablue has been stable for 3 weeks now 🙂 Amazing & such a relief! And oh yeah I agree on the four leggeds…they begin to know us as protector and friend….and we begin to connect more:) I love my animals so much…for me I have always been very in tune with my dogs, cats, horses as I was an only child growing up in a very isolated place…I do count that as a blessing as it was amazing to grow up that way:) I am praising God that Nylablue is stable and doing well:) Our animals love summer months….so much to watch and experience:) And Min Min is doing good…sometimes she gets frustrated and scared and I try to be right there for her to comfort her and make her know that no, you are safe Min Min…all is well. Hi HRCG I agree that cats & dogs are so interesting. They are both very different in their way of looking at the world. Dogs are always so happy & bouncy like young human children. i find cats have this thoughtfulness…well the older ones do. Kittens are like wound up springs & they just kind of *sproung* thru kittenhood til they mature. We hope Minnie is having a good week so far & Ellie too! Nylablue is stable so far & I am on the mend. Nylablue & Zoo do sound similar. Nylablue lets her feelings be known ALOT! Sounds like Minnie has her own ‘Morse Code’…. Mingflower would leave a tiny poo in my shoe….I would have 3-4 pairs out so rotated wearing them so I would get to the poo shoes a few days later. 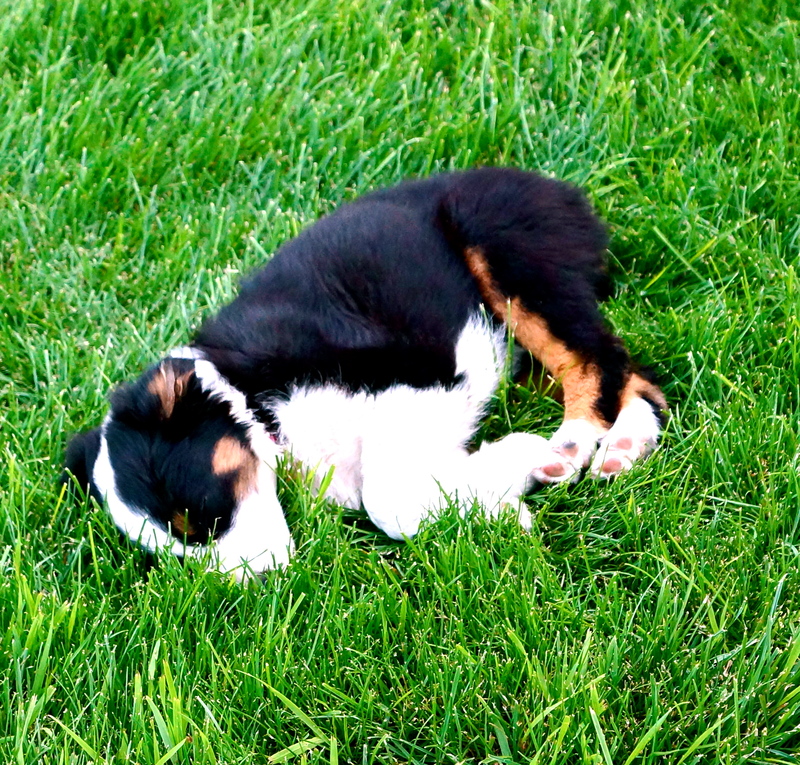 I would wonder what was in my shoe & it would be so funny when I tipped the shoe & a dry poo would fall out, rofwl……. I never got angry with her. It was just Mingy being Mingy! Nylablue was fine in her hiding spot which I still can’t find! I think my BP has recovered, lol. Hi HRCG there was more cattitude this week…I was getting a new dresser & had to take the old one out. Nylablue hid & i thought she got out. I was outside calling her & came in crying & so upset!! i checked everywhere…..or so I thought….next thing I know she appears; like Houdini…I chased her up into her cupboard & told her to ‘stay in there’ & closed the door 😉 She can just push it open…well she DID stay in there while the new dresser came in & I had finished chatting. I went to the cupboard 20 minutes later & opened the door & told her she could come out which she did! She came down & snuggled me so all was forgiven, rofwl…..
Hi HRCG Nylablue has had more cattitude today…we even had an arguement….it is hilarious listening to her “eeowwwing” & me talking back & it goes on & on…she wanted to go out but it was raining & cool. Then put her in Condo on patio to grant her wish & then had to chase her to get her into carrier for Vet’s. She acted up at the Vet’s so she is feeling pretty good. She sends her love to you & Minnie from the pantry where she is napping at the moment. I am so glad to hear Nylablue has her cattitude back! Minnie says “You rock gf”…Minnie has lots of that cattitude too and we often talk and grumble at each other on occasion:) You made my week!!! Hello HRCG: It is Sunday the 22nd & Miss Nylablue has more than enough Cattitude!!! She actually tried to ‘break out’ of the apartment 10 minutes ago!!! The Queen is definitely full of cattitude…I put her out in Condo so now she is looking sheepish outside…. Nylablue is acting better today. Last night she was a bit better esp when H. Poirot the stray cat came for his supper! She chased Greyboy away thru the patio door & then waited for H. Poirot to appear. Creator walks with me…I must have faith. Thank you for being so kind & compassionate! Please kiss Minnie & Ellie Bell for us. Oh how I wish I could help you both…please know my heart and prayers are with you…my dear Sherri-Ellen and my sweet Nylablue…you have been so brave and such a beautiful kitty angel…you will live forever in God’s heaven and someday you and your mama Sherri-Ellen will be together again. My tears are falling…Miss Nylablue you are so tender and sweet even when you are upset or mad…your heart is tender and beautiful. God Bless You Both and God Hold You Both In His Arms:) Minnie and Ellie Bell send loves and hugs and prayers too! Hello HRCG: somehow I have missed your reply here. Thank you for your kind words of encourgement. I too pray for Minnie’ sight to be restored too. Nylablue is fighting the ‘good fight’ & we know we are not winning but we are holding our ground here. How wonderful it is to love your life and be content! Breathless after readinbg this blog entry HRCG!!! Thank you for sharing your life; I never tire of it!!! There a lot of places that are the middle of nowhere, including in the middle of a city. You’ve got a BEAUTIFUL nowhere to live and lots of healthy hard work to go with it. An enviable life. Hi there! How are you feeling and doing? I hope all is well. I thought of you as I had to wear a heart holtor for 48 hours as my rhythm, will beat really fast and then slow and then fast enough to make me cough….weird. Anyway for now they say I am ok…the other issue for me right now is low sodium in my blood tests so I will see the doctor again this week. I know I have been blessed to live in the isolated places as I have seen interesting and beautiful scenery. 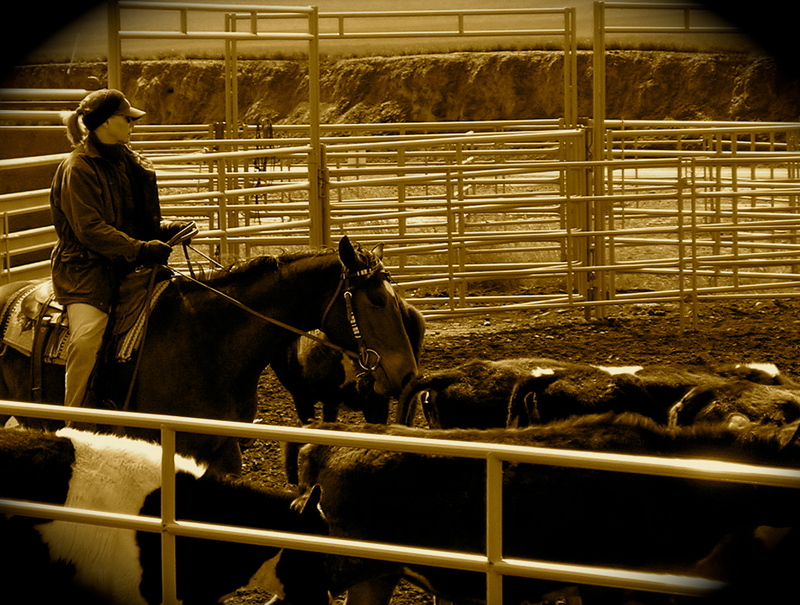 I only wish I had a better camera then and that WB had taken more pictures of me with my horses and on the ranches. Your home and area looks peaceful and quiet too….and that is awesome:) Sending big hugs to you and always prayers for your healing and your health. Tell Gary Hello for me too! I love your stories……and even without the beautiful accompanying photos your words fill my head with images of a life that I’ll never know except through friends who have experienced it. Thanks for sharing…..other than the snake stories (eeek) I’d love to have “been there/done that” !! Hi Pam, thank you for your encouragement and support of my memories and stories. I do appreciate your comments, as I never know if my words will be liked and will stir others hearts, and their memories too. I would have loved to have ridden with you…I can just see Sammie peaking out from your saddlebag:) Minnie would be in mine, giving Sammie the paws up! I truly am thankful for the lifestyle we have lived…we have experienced so many diverse parts of life. And I will forever be thankful for my parents raising me this way, on a remote cattle ranch. 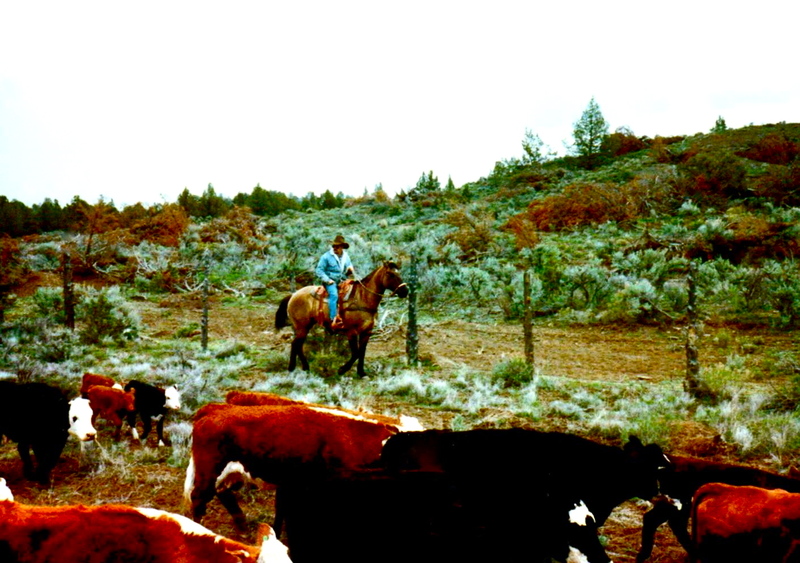 I miss that part but I do have the years and years of memories to hold on to…and WB and I made some good ones too when we managed a few ranches. Wishing you a beautiful sunny day:) We are to hit 92 today….which will be awfully warm when we are not used to it.